Posh fans are expected to pack out the ABAX Stadium when Leicester visit in the FA Cup. Peterborough United’s fourth round FA Cup tie with Premier League neighbours Leicester City has been made an all-ticket contest. The Premier League champions of 2015-16 booked their trip to the ABAX Stadium trip with a 2-0 third round replay win over Fleetwood last night (January 16). 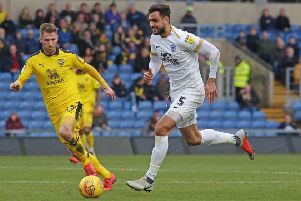 Posh expect a 14,000 sell-out crowd for a fourth round tie that will be televised live by BT Sport on January 27 (12.30pm kick off). No tickets will be sold on the day of the match. At 9am today (January 17), home sales for the tie had reached 5,000. Season ticket holder seats will be reserved until 9am on Monday, January 22. The Foxes are expected to sell out their allocation of around 4,000 tickets in the Motorpoint Stand and Main Stand. Tickets are on general sale (two per person/client ref) at www.theposhtickets.com, via the Ticketmaster Hotline 0844 847 1934 (calls cost 7ppm plus your network access fee) or in person at the ABAX Stadium Box Office during normal opening hours. Posh season ticket holders in the Motorpoint Stand will be offered seats elsewhere in the ground.